With a new start and finish in the city centrethis phenomenal course in its second year is an excitingaddition to the Great Run Series and offers a truly electric atmosphere. Not only will you be able to take in the stunning views through Doune, Dunblane and the Bridge of Allanbut you will also be running past the fantastic Blair Drummond safari Park before making your way back into Stirling City Centre! It will be a unique marathon experience unlike any other! We're the only charity fighting over 200 cancers including the one that matters most to you. Join our team and help raise money for our life-saving research. We'll get you to the finish linewith our expert training and fundraising advice. Whether you want to challenge yourself, be a source of inspiration to others or simply embrace a love of running, the high of crossing the Stirling Scottish Marathon finish line is a feeling you will want to experience. 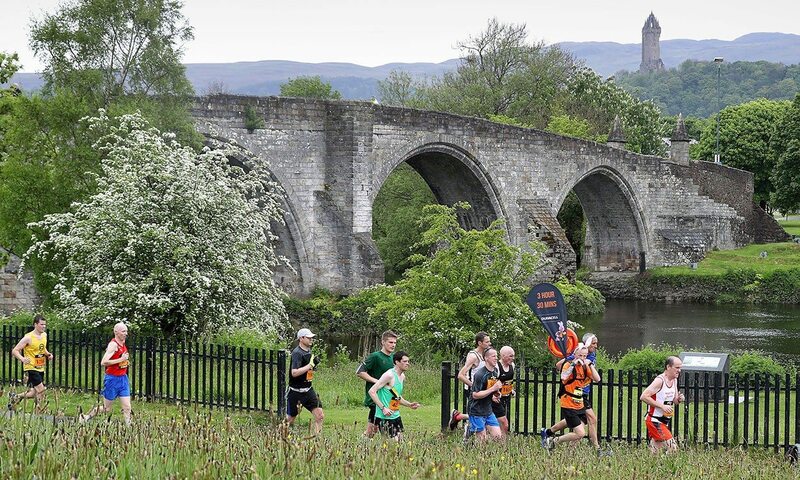 Held in the spectacular and historic setting of Stirlingshire, the predominantly fast and flat course will provide an awe-inspiring experience for experienced and first time marathoners alike. Starting in Blair Drummond Safari Park, with giraffes and elephants to send you on your way, the course takes in historic Doune Village and its famous castle through the beautiful towns of Dunblane and Bridge of Allan, around The University of Stirling, past the Wallace Monument and finishing under the shadow of Stirling Castle in Stirling city centre. 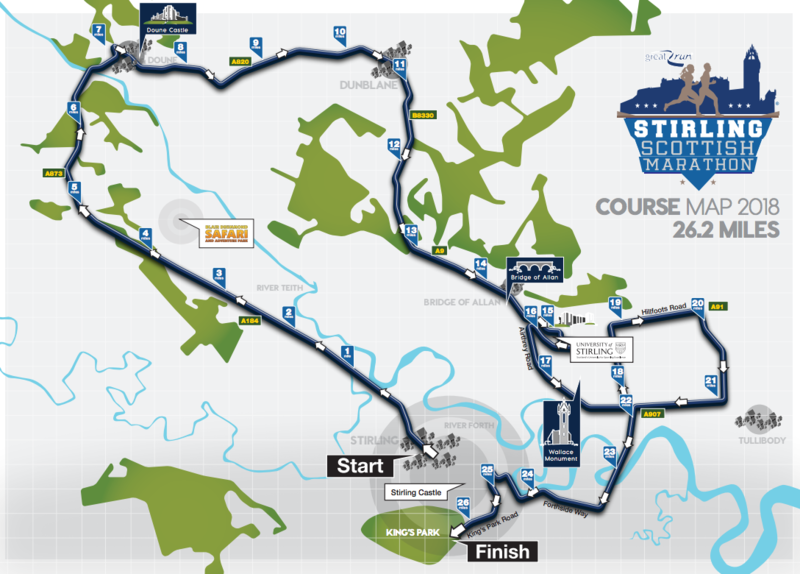 Starting in the city centre near to the imposing Stirling Castle, runners will make their way along the A84, passingBlair Drummond Safari Park on their way towards Doune. Crossing the historic Bridge of Teith, the route continues through Doune and on to Dunblane. 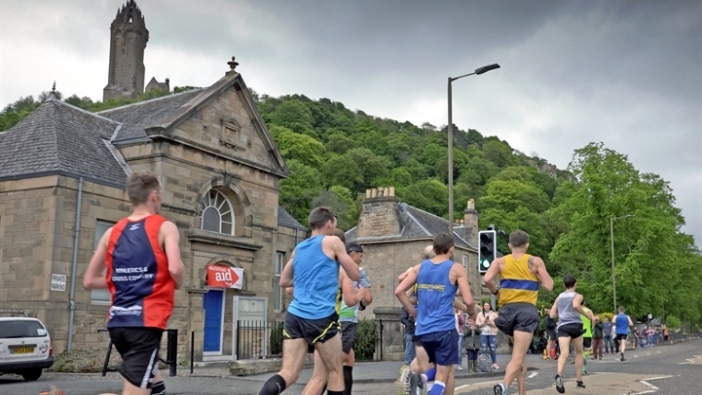 The route then follows the old A9, entering Bridge of Allan, then on to the University of Stirling where runners will complete a circuit of the campus, rejoining Airthrey Road, passing the historic Wallace Monument. A new part of the course will take in a long, scenic section along Hillfoots Road through Blairlogie, close to Tullibody, before returning to Stirling via the Springkerse area, along the riverside and in to the city centre, finishing on King's Park Road, alongside King's Park.